Mobile devices are changing the face of business. The growing penetration of mobile technology in everyday business activities is causing a revolution. Companies are leveraging the mobile applications to build great services for users. Whether it is accessing emails, accessing reports critical for decisions or performing day to day operational tasks, mobility is the new way for business. Many companies are looking to take advantage of mobile enterprise applications for business agility. With Mobile technology you can allow your staff to work on the go. Enable them with tools where they can access key information for sales, meetings or at a client location. Mobile enterprise applications help in better communication among team members. It also helps to collaborate, share information & improve productivity of the team members. A taxi sharing app like Uber is a good example of how simplicity can drive business. When things are developed for a specific purpose, they are designed with simplicity and cater to the business process. A mobile enterprise app can help to translate business processes into simple applications. The minimalist approach for a mobile enterprise app makes things easier to use. It also helps in serving customers better with more agility, responsiveness and improved service. The mobile devices can help in extraction lot of location based and contextual data from users. This data can be mined to read into existing usage patterns for improving services, and better forecasts with relevant user data. This can be used for marketing, sales & various other business units. The field service automation can greatly benefit from enterprise mobility. The field visits to customer locations, information management and maintenance services can be improved with mobile applications. The sales team can spend more time on ground with mobile connectivity. They have access to all information they need. They can spend more time in field sales and do away with office visits for data access or reporting. The ability to configure, price & send quotations to customers on the run is an added advantage for sales. Enterprises are looking to improvise their existing solutions for CRM, ERP, Finance, Human Resource management etc with mobile capabilities. All approvals and workflows benefit immensely with mobile connectivity. The approval notifications and processes can be simplified, fast tracked & automated with mobility. A lot of companies are still catching up to the mobile revolution. Many companies which are using traditional & legacy applications are finding it hard to customise things to adapt to the mobile age. An organisation which is run on mobile solutions is considered advanced by its customers. It improves brand perception of your company. The enterprise applications which are run on mobile make tracking things easy. The status updates are instant and any pending activities are immediately reported. The administration & work flow is greatly improved with a mobile enterprise application. Reduce clutter and eliminate redundancy, paper work to improve efficiency & agility. Mobile computing has changed the paradigm of business. Simple services that make users life easy are now being offered through mobiles. 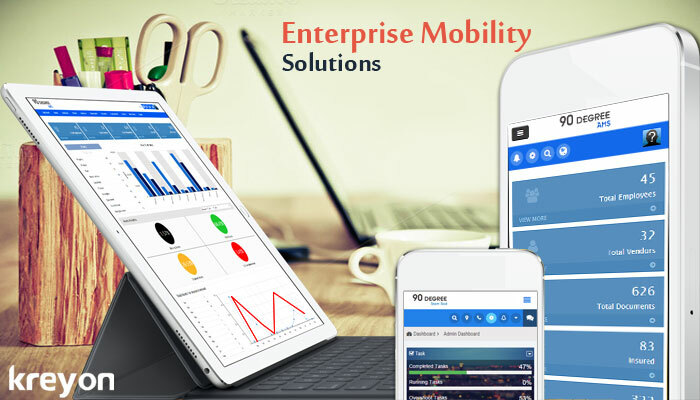 The goal of mobility solutions is integrate the mobile users, business processes and organisational objectives. The computing has been simplified & mobile devices are now capable of performing enormously complex tasks. The combination of cloud, mobile technology, and wireless internet access has revolutionized the way the world operates. The power is in the hands of the consumer.